The Fighting Irish will be looking to get back to the playoffs in 2019, but will have to replace several key players off of last year's 12-1 team. With spring practice half way through I take a look at 5 players who are primed to breakout into their own. Here are five breakout candidates for Notre Dame football as the Fighting Irish continue to work through spring practice in preparation for the 2019 season. The old adage is speed kills and that's exactly what Lenzy could help bring the Fighting Irish WR core this spring. Lenzy is a rising sophomore who came to Notre Dame to also run track but his focus this spring has been all football. Lenzy came into Notre Dame last season as a 4-star WR and the No. 10 athlete in the nation. He did not get any playing time his freshman season as he arrived at Notre Dame weighing 160 lbs soaking wet. With Miles Boykin, Chase Claypool and Chris Finke all entrenched as starters with experience at wide out last season it looked like it was going to be more of the same going into the playoffs and into 2019 with all of them having a year of eligibility left. But then the Cotton Bowl 30-3 massacre vs Clemson happened and it became painfully obvious that Notre Dame was missing elite play making skill players who can stretch the field that teams like Clemson have in abundance. Shortly after the season Boykin decided to declare for the NFL Draft and thus we have an open WR spot for Lenzy to grab this spring. Lenzy has the speed to stretch the field and the Matt Balis training table is already paying off as reports are Lenzy has bulked up to 180 lbs without losing any of his fast twitch, explosive playmaking skills. Early reports out of spring camp indicate Lenzy will be competing with rising junior Michael Young for a starting X WR position opposite Claypool and Finke. If Lenzy can grasp the playbook I think he can make a huge jump going into his sophomore season much like Will Fuller did in 2014 and Golden Tate in 2008 who both broke out with huge seasons. I know his QB Ian Book would love to use a weapon of Lenzy's skills and speed to make things easier on him as would all Fighting Irish fans. Tight End U hasn't exactly been tight end u these last few seasons with production dipping pretty much every season since Tyler Eifert was a first round pick in 2013. Kmet is going to get a huge opportunity here to turn the tide and make the TE a feared weapon again for the Fighting Irish. Alize Mack left for the NFL draft this spring opening up the starting tight end spot. While Alize was extremely talented he wasn't exactly reliable both on and off the field. Kmet who stands at 6'6 with great reach is also a star lefty relief pitcher for the baseball team up until two weeks ago when he decided to shut it down and focus solely on football. Like Lenzy deciding to skip track I think this could be huge for Kmet's development this spring and getting more repetitions with Book is never a bad thing. Kmet, a rising junior, entered Notre Dame as a 4-star prospect and the #3 tight end in the nation. He came into ND with fellow TE classmate Brock Wright who actually was the higher rated prospect at the time. In his first two seasons at ND Kmet has only 17 catches for 176 yards and the next time he catches a TD will be the first of his collegiate career. Now is the time for Kmet to shine (whom offensive coordinator Chip Long calls one of those DUDES meaning he's a beast) and take that next step up as he is currently running on the first team ahead of Wright and restore the luster of Tight End U to it's rightful place in Notre Dame. Ok technically Armstrong did start last season in the opener vs Michigan and had a breakout game with two TD but hear me out here. Armstrong was splitting carries with Tony Jones Jr before Dexter Williams returned from a 4-game suspension to take hold of the majority of the carries. This season Armstrong, the converted 4-star WR out of high school, is expected to be the bellcow for the Fighting Irish backfield. Armstrong possesses home run speed and since he played wide out he can also catch the ball out of the backfield. If you remember Dexter for as good as he was running the ball had some of the worst stone hands thus preventing him from reaching his full potential. Armstrong can and should be the starting RB all season. His game reminds me a lot of CJ Prosise who if you remember also converted from another position after his freshman season and then had a HUGE junior season for the 2015 squad. I think Armstrong can be that exact back for Notre Dame this season and it all starts this spring. Armstrong is going to have every opportunity to start and he needs to take advantage of it by developing his game this spring and I think new RB coach Lance Taylor will help him do just that. Purchase the Irish Mafia Shirt Here! Notre Dame has to replace senior DTs Jerry Tillery and Jonathan Bonner who basically started every game for the 2017 and 2018 seasons. While rising juniors Myron Tagovailoa-Amosa and Kurt Hinish are at this time expected to replace Tillery and Bonner in the starting lineup I actually think Jayson Ademilola will have the breakout spring. The 4-star DT and #12 DT in the nation arrived last season as a true freshman along with his twin brother Justin. Jayson played in 11 of the 12 games his freshman season providing meaningful reserve minutes while stepping in for the injured Tagovailoa-Amosa who was lost early in the season. Jayson more than held his own and racked up 4-tackle performances vs Wake Forest and Syracuse. Ademilola has a better initial snap burst into the line and quicker hands than Bonner and MTA creating separation which hopefully should cause plenty of opportunities for disruption which helps with tackles for loss and turnovers. Jayson isn't just a space eater to help linebackers and safeties make all the tackles. If he can continue to develop and stay healthy it wouldn't shock me to see him start over one of either MTA or Hinish in the season opener vs Louisville. He's that good. Genmark Heath aka the Swedish Black Guy is another guy that needs to have a huge spring to get a jump on the stacked linebacker competition which needs to replace starters Drue Tranquill and Te'von Coney. In other words no easy task replacing two guys who combined for over 200 tackles for the LEA-Gion of Doom Defense. Genmark Heath, a rising junior, is a converted safety prospect who played linebacker for the first time last season. He actually started for the injured Tranquill in the Northwestern game and more than held his own. He's accounted for 16 tackles each of his freshman and sophomore seasons so he has experience playing. Right now he's basically running on the 2nd team behind senior Asmar Bilal at the BUCK linebacker position. Bilal is the only returning starting linebacker but I think Genmark Heath has the size, length, athleticism, and speed that DC Clark Lea loves to have at the BUCK position. It wouldn't shock me with a great spring to see Genmark Heath take over the starting position. Purchase the Tailgate Like A Champion Touchdown Jesus Shirt Here! WatchND's Jack Nolan talked with Notre Dame offensive coordinator and quarterback's coach Mike Sanford about the on going battle for the starting quarterback position in fall camp yesterday. 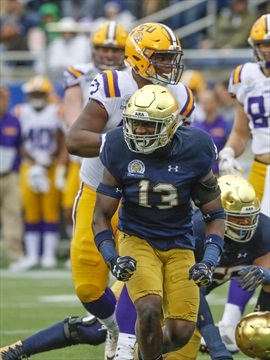 What we learned from Sanford is between Deshone Kizer and Malik Zaire the offense can virtually remain the same no matter who is behind center. This is a great thing in terms of running the offense crisply even if one of the two goes down with an injury. The coaching staff feels like the experience from both players should be a huge advantage but they need to work with their receivers who are on the opposite side of the experience spectrum. The receivers are very young but extremely talented and whichever QB can get on the same page with them during fall camp will win the starting job according to Sanford.